The Lincoln lawyer's Mickey Haller and LAPD detective Harry Bosch team up in this stunning new novel from the #1 New York Times bestselling author. Things are finally looking up for defense attorney Mickey Haller. After two years of wrong turns, he is back in the courtroom. When his famed former colleague Jerry Vincent is murdered, Haller inherits the biggest case he's ever had: defending Walter Elliot, a prominent Hollywood producer accused of murdering his wife and her lover. Haller has his hands full with Elliot, who seems more concerned about his movies than about a possible life sentence. With a key part of the defense's strategy missing, Mickey scrambles to prepare for trial, and the pressure only intensifies when he learns that Vincent's killer may be coming for him next. Enter Harry Bosch. Determined to find Vincent's murderer, Bosch will do whatever it takes to crack the case, even if that means using Haller as bait. Flip sides of the same coin, Haller and Bosch rarely see eye to eye on the law. But as danger mounts and the stakes rise, these two loners realize their only choice is to work as a team. 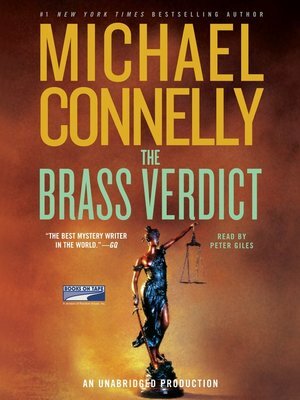 Bringing together two of Michael Connelly's best-loved characters, THE BRASS VERDICT is the most explosive novel yet by the author the Los Angeles Times has called "our laureate, proving again that popular fiction at its best . . . is also literature."